SunRock Solar’s final install for 2009 was a 4.6 kilowatt (kW) solar array system for the Loy family in Butler County. The Loy’s home site is a beautiful setting, but some of the tall trees surrounding the home also posed a shading issue that influenced our decision to use the Enphase microinverters. The installed system consisted of twenty Sharp 230 Watt modules and twenty Enphase microinverters. The Enphase microinverters used on this project are different from string inverters that are typically mounted inside a building and tied to a string of several modules. The microinverters attach to the module mounting hardware underneath each solar module and convert the direct current (DC) electricity from each module into utility grid compliant alternating current (AC) electricity. Shading on solar arrays causes significant power losses (i.e. $$$ lost), especially for batch inverters. For batch inverters, if only one module is shaded on a set of connected modules, the power output for the entire set of modules is reduced. The Enphase microinverters (pictured) improve the performance of the system because shading of one module does not affect other modules. System performance on arrays with microinverters can be 5 – 25% when compared to a batch inverter. The Loy’s also opted for the Enphase system monitoring solution, which collects and transmits performance data from each solar module to the Enphase Enlighten website. The Loy’s can monitor the performance of the solar array in real time, or look at performance for the week, month, or year to date. Here is a link to the system on the Enphase Enlighten website: Loy System Web Based Monitoring. The time lapse playback for the day or week is an impressive representation of the system’s power production. The above picture was taken just after one of the major winter snowfalls. The modules covered with snow are producing little to no power, but those modules that are clear of snow are producing power. 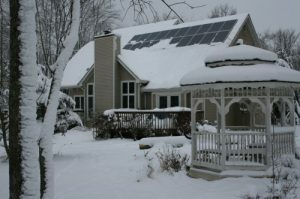 For a traditional string inverter setup the power production of all modules connected to those snow covered modules would be impacted. The Loy’s site has some shading issues, which makes the microinverter system the logical choice for this project. This new technology gives customers with similar shading issues the opportunity to have a solar array that’s power output is not significantly reduced due to the shading. If you think your roof space is not a good candidate for solar maybe an Enphase microinverter system is the answer for you!